Well, I was hoping this wasn't true, but alas, Miss Canada, Paola Nuñez, wore this lil "Totem Pole" number for the Miss Universe Preliminaries held two days ago in Las Vegas. The pageant will be televised live on Sunday, Dec 20, on FOX. What makes Canada unique? In the past, they've featured Mounties, maple leaves, and even hockey sticks, but they always come back to old standby: "the Native." So, while the Canadian public is so rife with violent racist attacks against Native people that CBC (the national public radio and television broadcaster) had to take action and shut down the comment sections on all stories about Aboriginal people (even the stories about our stolen sisters), it's interesting that the same populace proudly trots out a non-Native representative of their nation in an Aboriginal-themed costume. Repeatedly. Seriously, this is not the first time this has happened. Is the only good Indian a non-Indian in an Indian costume? Hell, what other message is being sent with these contradictory actions? : Hateful dismissive words on the one hand and applause applause applause on the other. If you feel so inclined, please let Miss Canada know that she still has time to make the right decision and rethink her "National Costume" - as it is a completely inaccurate representation of not only Aboriginal cultures, but also the state of affairs in Canada. Until we start seeing some real respect for our Indigenous sisters and brothers, hands off. Is it because the Canadian government doesn’t provide adequate mandatory K-12 education when it comes to First Nations histories, cultures, and communities because it doesn’t serve the interests of the nation? Is it because of mass historical amnesia? Is it because immigrants don’t know that we still exist? Is it because colonialism effectively took everything from Indigenous hands (I’m talking land, objects, our symbols, our names, our children, our designs, our stories) so Canada now sees it as essentially theirs to use however they want? Hey, you need to represent Canada?, oh let’s just dig around in this big ol’ free bin of Native American symbols and see what we can throw together without ever consulting one actual First Nations person. Yes, let’s stick with that. Because to start an actual dialogue would be the equivalent of pulling the loose thread on a very, very poorly knit sweater. I do not like this costume worn by this person, how does it represent First Nations/ Aboriginal people? a totem pole from her hips down? please!!! this looks nothing traditional, it looks like our traditions are being mocked!! bad on the designer!! Perhaps it would help to get Trudeau to establish national guidelines/protocols for research and interaction with indigenous culture in Canada? "The Australian Institute of Aboriginal and Torres Strait Islander Studies (AIATSIS) has created the Guidelines for Ethical Research in Australian Indigenous Studies (GERAIS) to ensure that research with and about Aboriginal and Torres Strait Islander peoples follows a process of meaningful engagement and reciprocity between the researcher and the individuals and/or communities involved in the research." Totally agree that this is NOT OK. Gosh, they need to do research before they parade around in an outfit that is definitely not Native, but has some Native items in it. Horrible. So glad Mrs. Universe, who is Native, does not do anything like that. There are so many reasons why this is distasteful, disrespectful, and a disgrace to Canada. The exact opposite of what I would expect Miss Universe Canada wants to portray to the entire world. Please make a different choice. The First Nations people are beautiful and this does not show their beauty at all..it shows a "loose" woman look and that is sad...the designer could have brought out her inner beauty by dressing her in an outfit you see on the dancers of Pine Ridge Indians in the USA...they have amazing outfits ! something like that but canadian .. 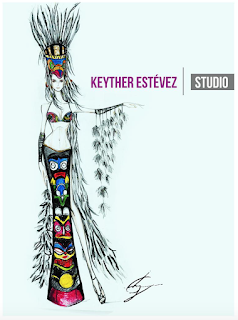 I went to Keyther Estevez's FB page, his work is generally very elegant and gracious, it is a shame the totem pole design was chosen for Miss Canada, it is over the top in tacky-ness, and ridiculous in concept. There must be people in charge who approved this design and they should be taken to task. Even purchasing some fabric yardage from Valentino, created from a glorious Christi Belcourt painting, would have been a wonderful beginning to a lovely costume for Miss Canada. Now we know that the dress was inspired by Dominican art, not the dress of native North Americans, so you all can get down off your high horses. I am very tired of First Nations people taking offense at every perceived insult to their culture, real or imagined. Legions of stand up comics make their living from insulting North American and Christian culture. What makes First Nations culture so special that one cannot poke fun at it anyway? What I would like to see in this country is a magazine like Charlie Hebdo that would poke fun at the ridiculous aspects of many different cultures, including First Nations. A Dominican immigrant designed it. It was not inspired by Dominican art. Work on your reading comprehension. Check your privilege Winer, and your manners. Personally, I prefer a world of equality and understanding. I feel bad that you've lost your ability to see the world for more than what it currently is. I thought this was Cher. If only this contestant could turn back time and make another fashion choice. Latina Here: The dress was inspired by CANADIAN First Nations NOT Dominican. The designer was grabbing from the many Nations that live on Turtle Island. As a Canadian Latina I am very disappointed in her lack of apology and we are pushing for her to make a statement, not from the Miss Universe Canada organization; It has to come from her. This is not the time to cower and hide after making a mistake, this is a time to come out and speak up and use this as an opportunity to change how the Latino community views First Nations in Canada. It is a chance to educate. In her silence she teaches others that its ok to appropriate and mis-use culture and that's not what so many of us are fighting hard to undo, the culture of the abuse against First Nations stopped a few years ago for good and everyone is accountable, even i had to hold myself accountable for the words and attitude. Pride is an ugly thing. We Latinos come from oppression, the same oppression that First Nations face, we should know better but the lure of entitlement that the dominant culture offered us was hard to pass up, now we have to go back and remember who we are, remember where we come from and remember why we are here, in Canada. Undo the Canadian colonization story and our Latino colonization story. We have a lot of work to do. That's why we can't let this slide. We need help from First Nations community to speak up, we need your help to create the Firestorm in order for her to be held accountable and to use her platform as Miss Universe Canada to educate, she's got the perfect opportunity to change things. I pray she uses this chance she's been given to do the right thing. Actually this looks like it was inspired directly by Isaac Mizrahi's 1991 "Totem Pole" dress—same yellow hands, similar faces, same garish color scheme. It's a misappropriation of a misappropriation. 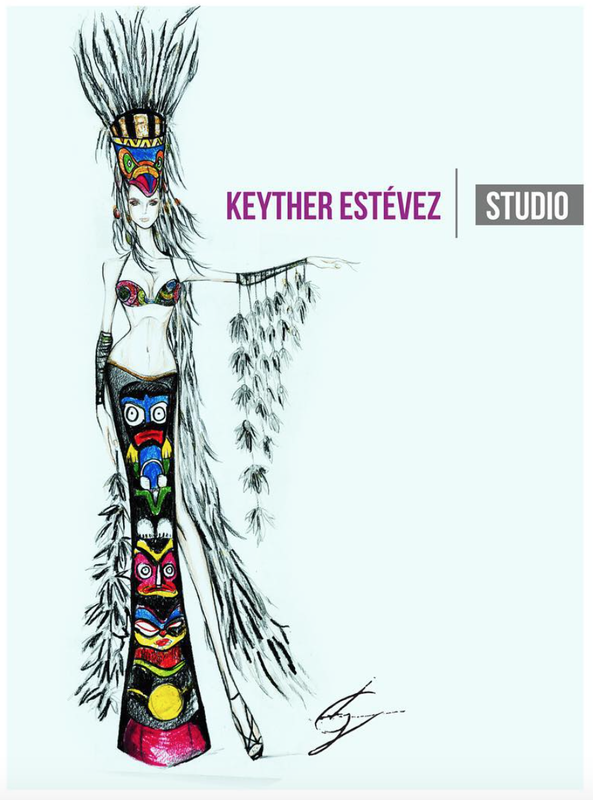 My question is... Why did they not hire a Native designer to design a dress for her?? Or at least a consultant on the matter?